Cinemaware recently announced four new games for the Atari ST computers. The games—Deathbringer, Federation, Total Eclipse and Dark Side—are part of a new software line named Spotlight Software, which features top games from around the world. According to Cinemaware's president Bob Jacob, "We are a rapidly expanding entertainment software company, and it is vital that we successfully compete in every entertainment category." He goes on to say that "Spotlight Software does just as its name suggests; it brings to the spotlight the very best game products we can find in the most popular game genres. With the addition of Spotlight Software, people can look to Cinemaware not only for the best interactive movies, but also for the finest fantasy role-playing, adventure, action-strategy, simulation and sports games." According to Cinemaware's president Bob Jacob, "We are a rapidly expanding entertainment software company, and it is vital that we successfully compete in every entertainment category." 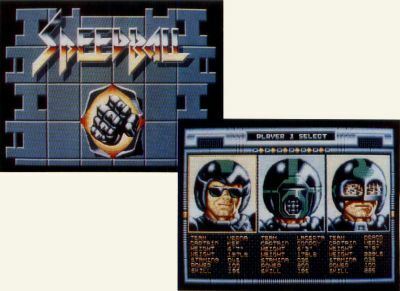 Also just shipping from Cinemaware is Speedball, the first title from their new affiliate, Image Works. Deathbringer, Total Eclipse, Speedball and Dark Side are priced at $39.95. Federation is slightly higher at $49.95. CIRCLE #113 ON READER SERVICE CARD.